Well, folks, today will be my last official "duty" as a member of the Babywise Friendly Blog Network. Imagine my shock when I saw an email from Valerie in my inbox 2 years ago asking me to join. Even though I didn't know Valerie, I spent many nights nursing Duke and searching various topics on her blog. She seriously pulled me through and helped me troubleshoot in those early months, and she didn't even know it. I've loved being a part of the network, but I know that my time is up. I'm learning when to say "yes" and "no," and I knew I needed to say "no" to this so that there would be room for new and different "yes" moments. I'm very thankful that I got to know these women (through the computer screen) and I have no doubt they will continue being a resource for so many parents out there. 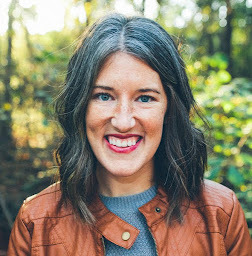 So for today, I'm posting on Carrie's blog on the areas to examine when overcoming anxiety, and she's here guest posting for me. I love that Carrie wrote about being done with the "having babies" phase. Because I consider myself young and still somewhat in the beginnings of all of this, the idea of closing up that entire chapter sounds scary and unknown. How will I really know that I'm done? is the question I ask myself. I hope you enjoy reading her post today. I always thought I would have 2 kids. Then, I when I was miserably pregnant with Laura Kate, I thought.. NEVER. AGAIN. Then, she was born. And I fell in love with having babies. As the years passed, I learned so many things through my pregnancies and my four babies about myself and my husband and Christ. Every new baby we added was a different transition for our family. Each one brought it’s own unique personality and challenges. You can read the full story here, but in short, none of them were particularly easy. Even so, I have loved it. Up until I was pregnant with Archer, I had decided that I would never really feel done having babies and that I was just going to have to trust Kyle when he felt like our family was complete. While feeling that, I prayed and asked the Lord to give me that feeling. And He did. During my pregnancy with Archer I was affirmed over and over that this was the last time. I knew it deep deep down that Archer would be the last baby I birthed and the last baby I nursed. The decision wasn’t based on what anyone else’s idea was about family size (and let me tell you, there were plenty of opinions) but one that I felt directly in my heart from the Lord. And was confirmed by Kyle. The past eight months have been a roller coaster for me emotionally. I have not wavered from the decision that our family is full and complete, but the sadness of the decision has surprised me. What I wasn’t prepared for were the emotions that would come with knowing I was done. It didn’t really set in until we drove home from the hospital to bring Archer home that I realized it was the last time I would get to do that and the sadness of that that (mixed with the hormones!) washed over me. 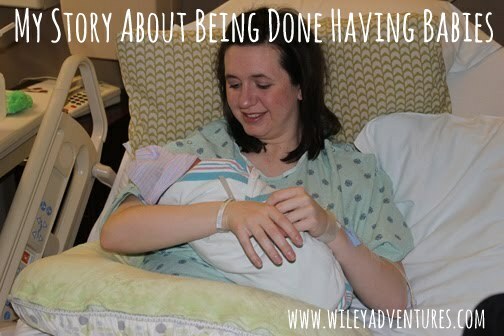 Throughout this season, there are three big things I have learned about “being done”. 1. The decision for every family is different. I have many friends who families look very different from each other. Throughout the process of seeking God’s will for our family, I had to recognize and realize that what may be true and right for one family may not be the same for mine. This may seem really obvious, and I knew it in my head, but it took a while to see it in my heart. 2. You have to separate the emotions from the decision. There have been times that I’ve questioned, because I was so sad, whether I was sure we were done or not. But every time I brought it back to the Lord I was affirmed again in our decision. Over time, I started to realize that it’s ok to be sad about the decision and for the decision to be done to still be what’s right for us. The emotions and the decision can co-exist. 3. It helps to remember why it’s a big deal. I think the reason it’s ok to be sad about being done is because having babies is a BIG DEAL. In my lifetime, the greatest events that will happen, have now happened: getting married and having these four babies. For me, recognizing this has validated my emotions. I am so grateful for the four healthy babies the Lord has blessed us with. And I know that what I am learning in this season is with great purpose for the coming days of raising them.